You can add louvre window, skylight, tool holders and the list goes on. For the yardsaver range we do have a flooring kit which is perfect for non level surfaces & for semi-permanent installations where you can add plywood or slats to create flooring surface. 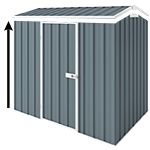 Strong & durable 80X40mm galvanised steel frame. Could be used in conjunction with road base or as a frame for formwork. We hope this is of assistance to you, should there be anything else that we can assist you with, please feel free to let us know.